Simple In-Office Procedure Clears Blocked Sinus Passages. Facial pain and pressure, headaches, and difficulty breathing all can accompany sinusitis. When medications don’t bring relief, patients often have to choose between continued discomfort and invasive surgery. Not anymore. “Balloon sinus dilation is an excellent way to relieve the symptoms of sinusitis without invasive surgery,” says Renick Webb, MD, of Red River ENT Associates. “Insurance companies have embraced this procedure because it is costeffective and provides longlasting results with a very low revision rate. Before recommending this procedure, the doctors at Red River ENT Associates perform a thorough exam, which includes a CT scan, to determine whether the sinus passageways are blocked or whether symptoms are due to another cause. “A patient can come in for an initial evaluation, speak to a surgeon, and leave the office with an accurate diagnosis and a confirmed appointment for the procedure,” says Dr. Webb. Just a 20-minute procedure, balloon sinus dilation is performed in the comfort of the office while a patient is relaxed with oral sedation. A topical spray and lidocaine injection are used to anesthetize the treatment area. The doctor guides a tiny catheter into the area of sinus blockage, the balloon is gently inflated, and the sinus passageway is opened, restoring airflow and relieving discomfort. “We advise patients to avoid strenuous exercise or weight-lifting for forty-eight to seventy-two hours following treatment,” says Dr. Webb. While every patient’s experience is different, he reports that balloon sinus dilation offers a fairly long-lasting and reliable solution, with only 5 percent of patients requiring retreatment. Invasive sinus surgery requires revision in 15 to 25 percent of cases. 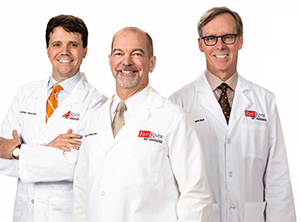 “This procedure has been a real benefit to our patients,” confirms Dr. Webb.